Germany’s BDI industry association is calling for an “investment offensive” from the Federal Government, saying that strengthening business confidence should be a top priority amid the economic downturn, and hailing TTIP as a “historic opportunity”. EURACTIV Germany reports. “It is of central importance that further cost burdens and regulations on companies are avoided,” said Ulrich Grillo, the president of the Federation of German Industries (BDI). “The fact that our industry is still competitive and our businesses still hold a good position globally, is at stake,” warned Grillo, who was speaking on Tuesday (23 September) at the German Industry Day event in Berlin. Germany is in the midst of an economic slowdown, according to the latest data. The BDI group, Germany’s leading business lobby, recently dropped its growth prediction for the current year to only 1.5%. The association’s previous estimate was 2%. The lowered expectations are a result of growing international tensions and political uncertainty, the BDI said. Around 1,300 guests from economic and political backgrounds were expected at the BDI’s German Industry Day. Guest speakers included German Chancellor Angela Merkel (CDU) and French Prime Minister Manuel Valls. “Creating an investment offensive is the greatest challenge to Germany’s sustainability,” Grillo stated. Higher investment is not an end in itself, the BDI chief explained. In the medium-term, it boosts an economy’s growth potential. The biggest hurdle for increasing private investment, he said, are unstable conditions. “Most of all, that applies to substantial investments that are needed to carry out the Energiewende,” or energy transition, Grillo pointed out. He also singled out the expansion of the super-fast broadband internet, saying the state must create the right framework conditions for rolling out new networks. German companies are already investing: Two-thirds of all research and development spending in the country comes from the private sector, and around 90% of all private research and development expenditure come from industry. “Since many other OECD countries support innovation with tax revenue, it is high time that Germany also introduces research promotion through the tax system,” Grillo said. In this context, the BDI’s president also welcomed the Finance Ministry’s plans to introduce a patent box. Last week, the BDI’s managing director Markus Kerber also praised the move. “Targeted lower taxation of profits from patents – a so-called patent box – makes it considerably more attractive to do research activities in Germany,” Kerber said, according to the Irish Times. The BDI president called the Transatlantic Trade and Investment Partnership (TTIP) between the EU and United States, “a historic opportunity”. “Europe must improve its position with regard to international trade. To do this, it is important that the EU conclude the free trade agreement with the United States,” he said. On Tuesday, Merkel renewed her praise for TTIP as an instrument of trade. In light of weak growth in Europe, she was particularly positive about the opportunities TTIP offers. Everything should be done, she said, to interconnect the two biggest markets with a free trade agreement. “When is the right time, if not now?” the centre-right leader said during her speech at the German Industry Day. 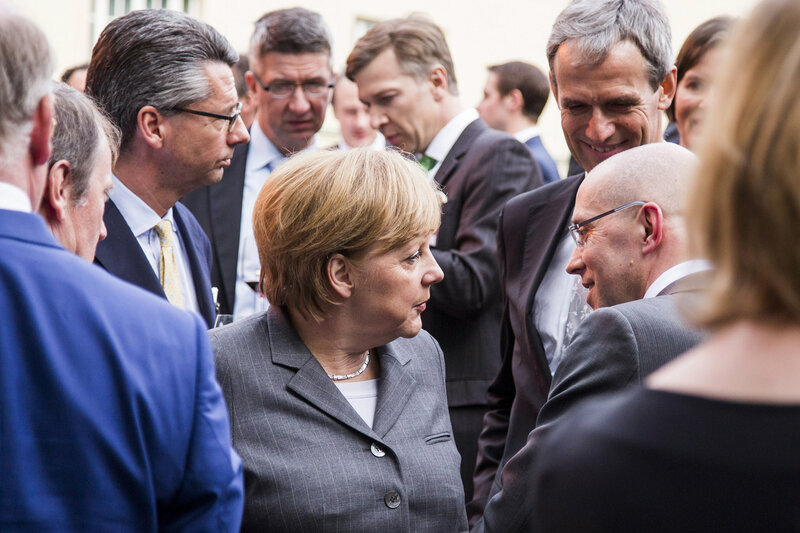 At the German Craftsmen’s Day on 19 September, the Chancellor also spoke highly of the trade agreement: She said it was clear to her that the advantages far exceed the supposed disadvantages. Horrifying and scary scenarios being disseminated will not come become reality, Merkel said. “Neither chlorine-treated chicken, nor genetically modified foods will be able to be imported into the European Union,” the German Chancellor assured. The Federal Government is making efforts, the Chancellor commented, to resolve widespread criticism of the planned agreement. Negotiations between the US and the EU on the Transatlantic Trade and Investment Partnership (TTIP) will begin their seventh round next week. Talks began in July, 2013. The deal could save companies millions of euro and create hundreds of thousands of new jobs on both sides of the Atlantic. The average European household could save €545 per year and European GDP could increase by nearly 0.5%. If they can guarantee that no gmo food will be imported into Europe then they will have won the day.